Hysteria Music started life as an online E-Zine, focusing on the Exmouth music scene, and is now expanding in to an online directory and social site for local musicians. I had been tasked with full control over the re-branding of the business, logo and stationery, as well as website design and a unique development package which includes a directory and forum structure for musicians. 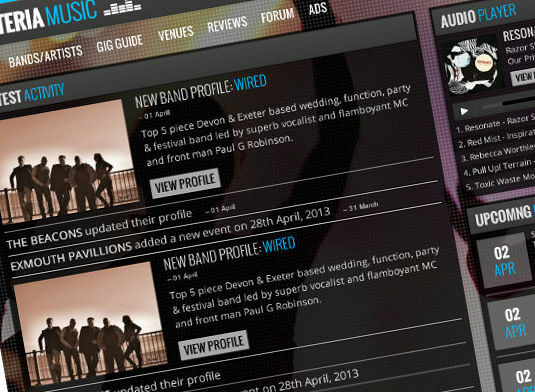 this will allow local venues and bands to put their profiles and upcoming events in to the system. The logo is simple yet striking, immediately telling the user that music is the name of the game.